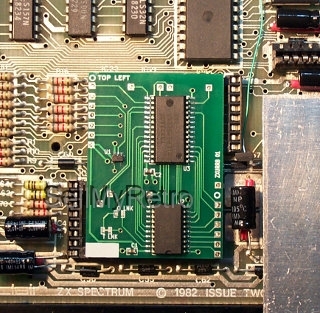 This module can be used to replace the eight 4532 (or equivalent) ICs that form the upper 32 kilobytes of RAM in a 48K ZX Spectrum computer or to upgrade a 16K ZX Spectrum to a 48K model. The ZX Spectrum must be an issue 2 or later. The upper RAM support ICs IC23, IC24, IC25 and IC26 must be present and functioning. It will probably be necessary to fit these in addition to this module when upgrading a 16K Spectrum to a 48K model. Click here for installation instructions. Delivery: Price includes delivery to UK and associated postal regions. Postage to anywhere else is £2.80 extra for up to 3 modules. Please contact for a quote if you want to purchase more than 3. Payment: PayPal or transfer of the exact amount to a UK bank account accepted. Account details will be sent on request. 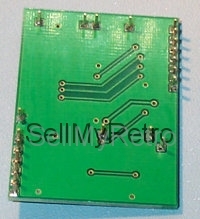 ZX Spectrum lower RAM replacement module: This module is also on sale at this site at the same price and orders of the two types can be combined. If you wish to make a mixed purchase, please select one type only and place an order for the total number of modules you want and then send a message saying how many of each type you want. For example, to purchase one upper RAM and one lower RAM module, place an order for two upper RAM modules and send a message stating that you want one of each type instead.